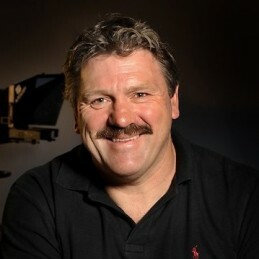 Brian Taylor is a much loved sporting media personality and former AFL footballer with the Richmond and Collingwood Football Clubs. His current media commitments include Channel 9, Fox Sports and Triple M radio. The moustachioed Taylor, known as ‘Barge’, ‘Bristle’ or ‘BT’, began his VFL career with Richmond in 1980. He eventually left the Tigers for Collingwood at the end of the 1984 season, having played 43 games and kicking 156 goals. It was at the Magpies where he cemented his place as a fan favourite. A larger than life player, Brian Taylor was a successful full forward and in his second year at Collingwood he kicked 100 goals to win the Coleman Medal. Due to knee injuries in the following year, Taylor retired at the end of the 1990 season at only 28 years of age. He had played 97 games for the Magpies, kicking 371 goals. After retiring, Brian Taylor’s public image continued to build considerably. While he had several minor coaching roles, it was his work behind the microphone for the Triple M AFL commentary where he really made a name for himself. His passionate and rousing calling style soon became a listeners’ favourite and his immortal line ‘Triple M ROCKS Football’ is as present as ever. Brian has since grown his media commitments to include work on the Sunday Footy Show on Channel 9 as well as being a member of the Fox Sports commentary team. He is now considered not only one of football’s most colourful characters but also one of the best callers and commentators. Brian Taylor has also continued his development work in footballing world where he uses his extensive knowledge of the game as a forward coach for many of the biggest names in the AFL. A wonderfully engaging and entertaining character, Brian Taylor is the perfect speaker or master of ceremonies for any event.